The Canadian federal government is currently working on policies that will help get more zero-emission vehicles onto Canadian roads. The way current technology stands, that means electric vehicles. Because pleasure boat exhaust emissions these day are low, boaters are unlikely to see any policies encouraging or legislating zero-emission power boats. Nonetheless, electric-powered and hybrid boats are filling a growing niche in the Canadian boating marketplace, so when the automotive world makes the seemingly inevitable move away from petroleum, pleasure boaters may be ready to follow suit. Electric auxiliary motors, like the trolling motors found on almost every bass boat, are already well-established. But larger portable outboards, most built by Torqeedo, are increasingly powering dinghies and small pontoon boats. All-electric power is also becoming more feasible for cottage runabouts and towsports boats, while diesel-electric hybrid cruising boats are also making an appearance. I first wrote about the development of zero-emission electric boats and hybrid boats in these pages about five years ago. Since then, there hasn’t been a flood of new arrivals on the market, but boats that appeared then are increasingly gaining a toe-hold. 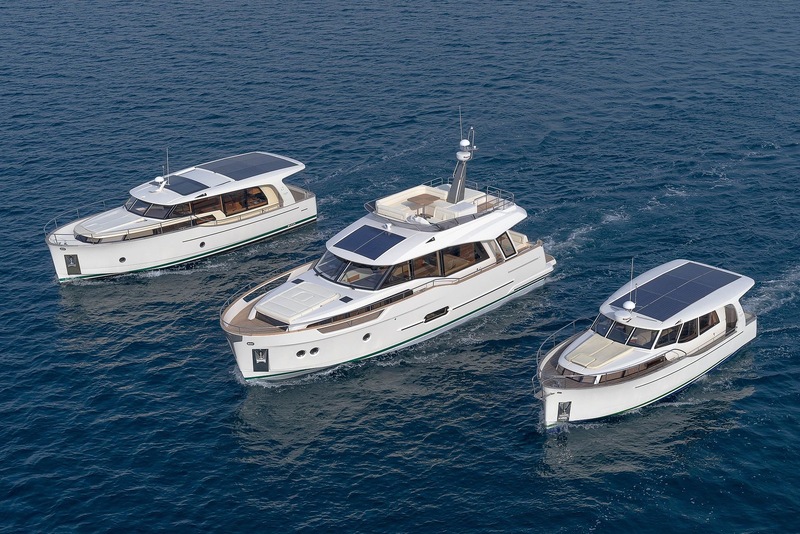 Greenline, a manufacturer based in Slovenia that builds a line of five diesel-electric hybrid yachts from 33 to 65 feet, now has its first Canadian dealer, Georgian Harbour Yacht Sales in Penetanguishene, Ont. The first boat to arrive there was a Greenline 33 Hybrid. It has classic sedan yacht lines, but an efficient “super displacement” hull design and an up-to-the-minute propulsion system. With a Volvo Penta D3 200-hp diesel, the boat has a range of about 700 miles travelling at seven knots on diesel-power — when the in-line electric engine becomes a generator to recharge batteries. Using a bank of lithium-polymer batteries, a roof full of solar panels and its 10-kw electric motor, the boat has a range of about 20 miles on battery-power alone. Most cruisers will use a combination of all-electric and diesel power. Gerry Zidner president of Georgian Harbour Yacht Sales, says he heads onto the bay on demonstration runs under battery power alone, enjoying the silent, exhaust fume-free experience. “I love the peace and quiet of it,” he says. “I only fire up the diesel to show off the capability and speed.” Ontario boaters had a chance to see the boat at shows last summer, including the Port Credit In-Water Boat Show in August. 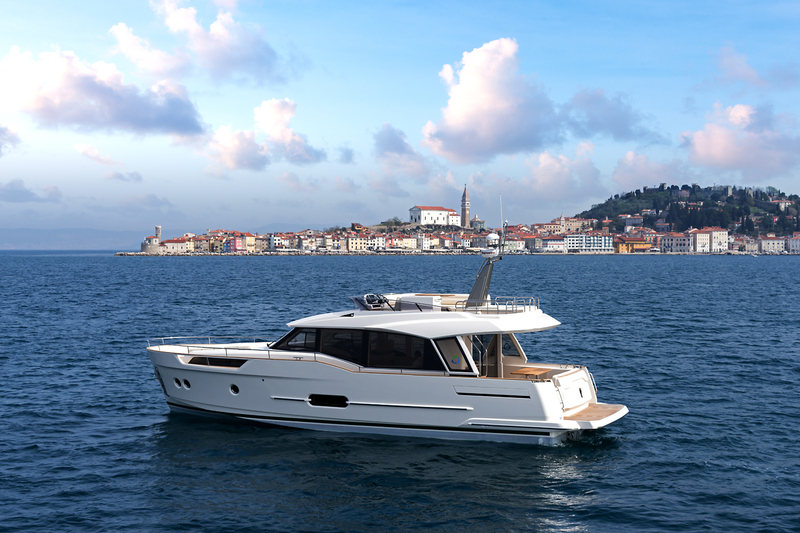 Zidner hoped the boat would be sold before heading south for fall boat shows in the U.S.A.
With more than 400 of the Greenline 33s already sold globally, it’s a well-proven design. Meanwhile, a Canadian-built electric boat that made its debut about five years ago has found a place in the lineup of the Quebec-based Canadian Electric Boat Company. The Bruce 22, designed by the late Ian Bruce and powered by a PMSM 100 Piktronik 100-kw electronic motor, develops the equivalent of about 136 hp. The Electric Boat Company also sells the displacement-speed 21’ 7” Fantail and the 15’6” Quietude, powered by Minn Kota or Torqeedo engines. Princecraft also continues to market its Torqeedo outboard-powered 15- and 17-foot BRIOe pontoon boats. With the expanding electric automobile market bringing down the cost of batteries and raising the bar on other technology, zero-emission vehicles may soon become commonplace. Zero-emission boats will not be far behind.